You may submit your completed house history electronically by filling out the House History Electronic Submission Form below. When the fields are complete, click on the green "SUBMIT" button at the bottom of the form. 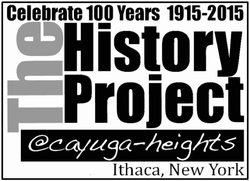 The Cayuga Heights History Project will then publish it on the site and link it to the interactive map. To protect the privacy of current residents, no information about current house residents will be published on the site. Upload any significant photos or documents with the "Upload File" tool below.